While more than a billion people lack safe water and 2.6 billion lack access to sanitation worldwide, numerous technologies and approaches already exist to provide access to clean water, safe sanitation, and hygiene education. In a report from the Pacific Institute and the Woodrow Wilscon Center’s Environmental Change and Security Program (ECSP), scientists and development experts evaluate existing resources and identify a pressing need still remains for a comprehensive decision-making tool that can assist practitioners in evaluating and identifying the best technology or approach to meet their water, sanitation, and hygiene (WASH) needs. 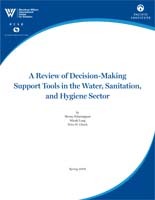 “A Review of Decision-Making Support Tools in the Water, Sanitation, and Hygiene Sector” evaluates 120 existing resources in the WASH sector, finds significant gaps, and recommends the development of a decision-making tool that can help practitioners evaluate which approaches are appropriate for their situation.